Have you been experiencing any of these lately? How about several natural remedy solutions for your seasonal allergies? Increased exposure to allergens/irritants: like pollen, dust, or chemicals in the air. Compromised mucous membranes in our noses, eyes and sinuses. When these membranes become dried andbreakdown they cannot offer protection from the airborne irritants. Food sensitivities. When we eat foods that our bodies are sensitive to the body’s immune system responds by causing inflammation. This inflammation causes symptoms, some may not even be detectable until the burden on our immune system is increased as with pollen. Eat honey: local honey contains small amounts of the local pollen and by consuming regularly it can help to esensitize our immune system, much like how allergy shots work. Consume approx 1 tsp daily before and during allergy season. Keep mucous membranes moist. Our mucous membranes become dried out, especially after the dry winter air. Use a simple saline nasal spray. Saline (salt water), helps maintain the integrity of our mucous membranes. Additionally, using a saline nasal spray on a regular basis can help rinse out allergens from the nose and decrease the number of irritants. Do a sinus saline wash. A more intensive therapy for your sinuses and mucous membranes is to use a neti pot (sinus lavage). This can be extremely beneficial for those who are having a lot of nasal congestion. This involves either using a pot that resembles a genie lamp or a sports cap water bottle. Prepare a saline solution: ¼ heaping tsp salt to 1 cup warm water. Put this into your pot or bottle. Tilt your head to one side and slightly forward (over a sink) and insert the nozzle of the pot (or bottle) into your top nostril. 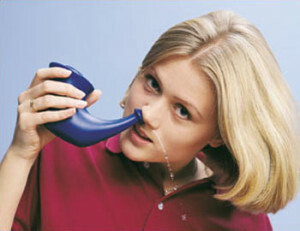 Gently allow the warm saline solution to flow through your sinuses and it will begin to flow out of your bottom nostril. Now be certain to breathe through your mouth as you do this. After you finish one side, blow several forceful breaths out of your nose to expel any excess saline or mucus. Repeat on the other side. Avoid foods that you are sensitive to. One of the best ways to reveal food sensitivities is through a blood test. We use the top labs to test your body’s immune reaction for up to 184 different foods. Most conventional doctors only test for common reactions (eg. when eating strawberries you break out in hives). A more comprehensive test is one that test a variety of foods and also detects latent food sensitivities. This is one of the many tests available through Carolinas Natural Health Center. READ more on Food Sensitivity Testing here. Stabilize your mast cells –an important part of our immune system. When mast cells break down they release histamines causing many of the allergy symptoms. This is why we use anti-histamines for allergy relief. Thankfully nature has provided us with several effective ways to help stabilize these mast cells. Consume more fruits and vegetables –especially the colorful ones: broccoli, citrus, red peppers, purple cabbage, dark green leafy vegetables. The colors are what contain bioflavonoids and along with vitamin C (also found in high amounts in these same foods). You can consider supplementing with additional vitamin C, but look for a product that also contains bioflavonoids and quercetin. There are also several herbs that are very effective: Nettles, turmeric, bayberry, feverfew, eyebright, goldenseal and yarrow. 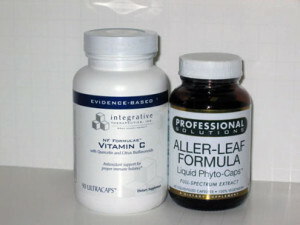 A product that contains these herbs is Aller-leaf by Gaia Herbs, a North Carolina based company. 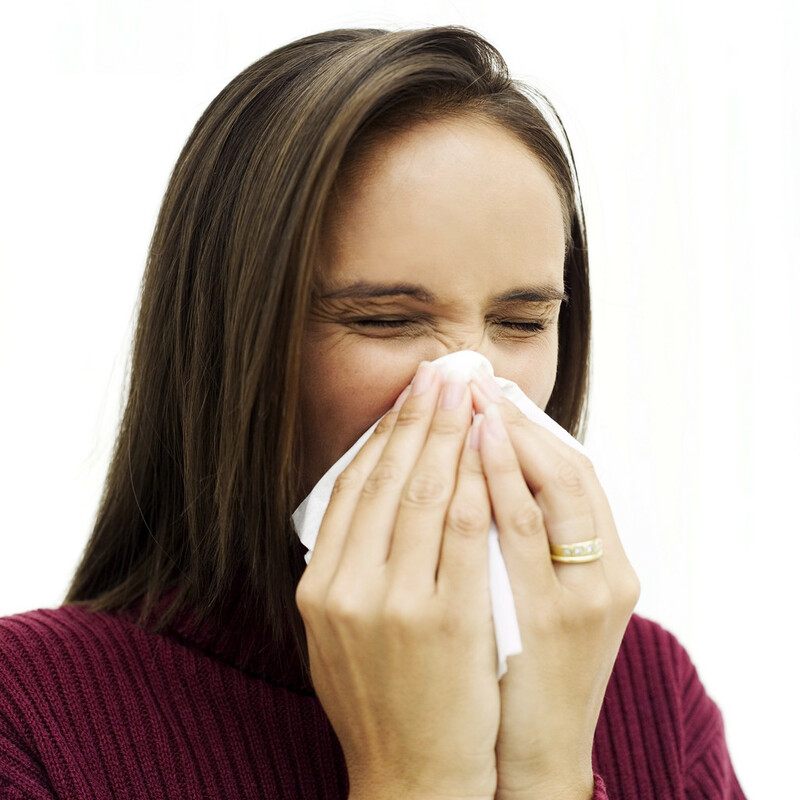 Don’t be without these key products to help alleviate your allergies. Now available here. Eliminate processed foods that can cause inflammation. Increase consumption of fruits and vegetables daily: the goal is 7-13 servings! Decrease exposure to chemicals and environmental irritants. I bid you happy Spring! Thanks for this information. Very informative. My grandson uses the neti pot which gives him a lot of relief. This is something I deal with almost everyday! I’ve often wondered if there were natural remedies to help alleviate it. Thanks for the post!